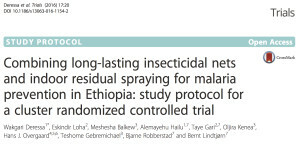 Combining indoor residual spraying and long-lasting insecticidal nets for preventing malaria: Cluster randomised trial in Ethiopia. Background Long-lasting insecticidal nets (LLINs) and indoor residual spraying (IRS) are the main malaria prevention interventions in Ethiopia. There is conflicting evidence that the combined application of both interventions is better than either LLINs or IRS used alone. This trial aims to investigate whether the combination of LLINs (PermaNet 2.0, Vestergaard Frandsen, Lausanne, Switzerland) with IRS using propoxur will enhance the protective benefits and cost-effectiveness of the interventions against malaria and its effect on mosquito behavior, as compared to each intervention alone. Methods/Design This 2 x 2 factorial cluster randomized controlled trial is being carried out in the Adami Tullu district in south-central Ethiopia for about 116 weeks from September 2014 to December 2016. The trial is based on four arms: LLINs + IRS, LLINs alone, IRS alone and control. Villages (or clusters) will be the unit of randomization. The sample size includes 44 clusters per arm, with each cluster comprised of approximately 35 households (about 175 people). Prior to intervention, all households in the LLINs + IRS and LLINs alone arms will be provided with LLINs free of charge. Households in the LLINs + IRS and IRS alone arms will be sprayed with carbamate propoxur once a year just before the main malaria transmission season throughout the investigation. The primary outcome of this trial will be a malaria incidence based on the results of the rapid diagnostic tests in patients with a fever or history of fever attending health posts by passive case detection. Community-based surveys will be conducted each year to assess anemia among children 5–59 months old. In addition, community-based malaria prevalence surveys will be conducted each year on a representative sample of households during the main transmission season. The cost-effectiveness of the interventions and entomological studies will be simultaneously conducted. Analysis will be based on an intention-to-treat principle. Discussion This trial aims to provide evidence on the combined use of LLINs and IRS for malaria prevention by answering the following research questions: Can the combined use of LLINs and IRS significantly reduce the incidence of malaria compared with the use of either LLINs or IRS alone? And is the reduced incidence justifiable compared to the added costs? Will the combined use of LLINs and IRS reduce vector density, infection, longevity and the entomological inoculation rate? These data are crucial in order to maximize the impact of vector control interventions on the morbidity and mortality of malaria. Trial registration PACTR201411000882128 (8 September 2014). Gari T, Loha E, Deressa W, Solomon T, Atsbeha H, Assegid M, Hailu A, Lindtjorn B. Anaemia among children in a drought affected community in South-central Ethiopia. 2017. PLoS ONE, In press. The trial ended on January 2017. We are now analysing the data, and we plan a number of publications in the coming months. 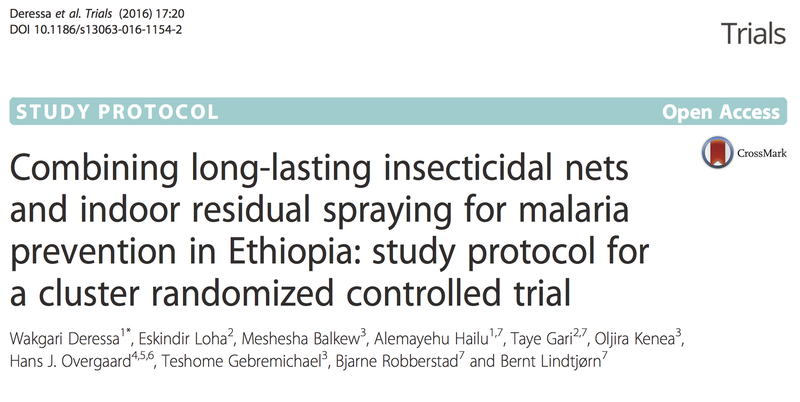 In January 2013 we finalised all agreements regarding the Norwegian Research Council grant regarding the MalTrials project: Combining indoor residual spraying and long-lasting insecticidal nets for preventing malaria: Cluster randomised trial in Ethiopia. Ethical clearance: We have applied for ethical permission to start the project, and we hope to get these permissions in July. Select three kebeles (about 30 Gares, villages). We shall measure the incidence; find out the variation in incidence between the villages. This will enable us to calculate the correct sample size for our trial. We plan to start the main malaria trial in early 2014. This research aims to improve malaria control by evaluating the combined effect of indoor residual spraying (IRS) and long-lasting insecticidal nets (LLINs) on malaria incidence in Ethiopia. This project addresses how to promote uptake of research findings into public health programmes by enhancing our knowledge on interventions that will improve the effectiveness and coverage of malaria control programmes. It includes community randomised controlled trials to assess effectiveness of multiple interventions in combination versus one method alone within routine malaria control settings. The clinical study objectives are to examine if IRS with insecticide and LLINs provide added protection against clinical malaria compared with LLINs alone. In the health economic part we shall estimate the costs of LLINs alone or combined with IRS, compared with current standard practice in the study settings. The study will also include studies on the anopheles mosquito where we aim to assess whether IRS with insecticide plus LLINs reduces vector biting and resting preference and density, longevity, infection and entomological inoculation rates inside houses when compared with LLIN alone. We plan to start preliminary studies in late 2012, with start of the trial during the main malaria season in 2013. The planned study site is in the Adami Tullu area in the central part of the Rift valley in Ethiopia. This research will build up on the already established research collaboration between the University of Bergen, Addis Ababa University (School of Public Health and Aklilu Lemma Institute of Pathobiology), Hawassa University, and the Ethiopian Ministry of Health (Malaria Control).